Randy Peters is doing a restoration of the old Keenan-Addy Roadster. You might know this car as the white #35 driven by Skip Manning - it did appear at Oswego with Johnny Logan driving. Randy is looking for any history or old pictures, so if you have any information about the car or would just like to converse with him about it, contact him at skate4343@hotmail.com. Johnny Logan poses next to the Keenan-Addy car. Out of Fenton, MI, the car was owned by George Keenan and Tom Addy. 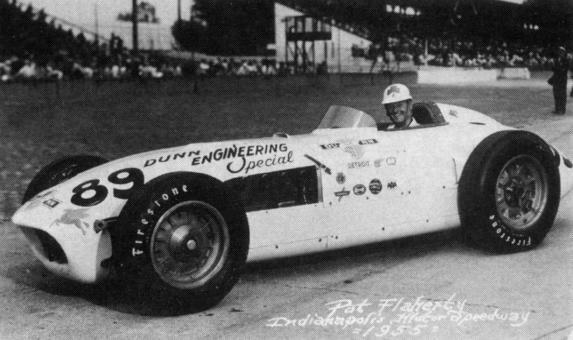 In 1955, Pat Flaherty drove the Dunn Engineering Indy roadster. 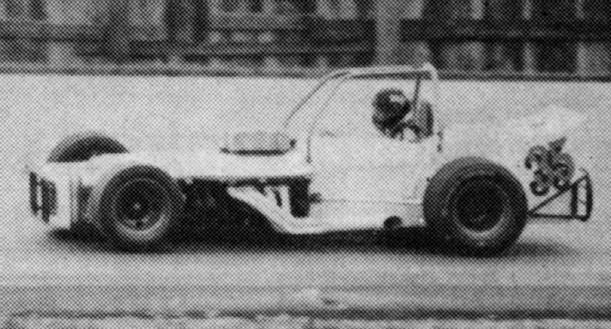 The Keenan-Addy supermodified used the suspension off this car - they literally cut the front and back suspensions off and spliced them on to a supermodified middle. 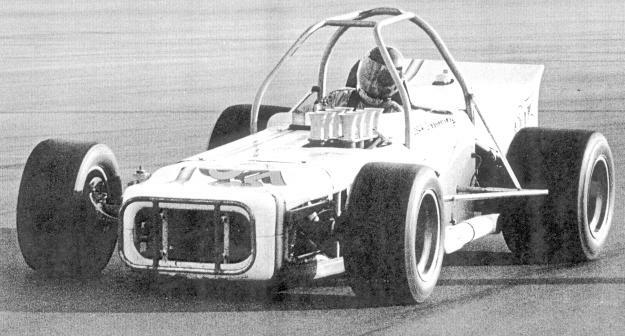 This desired suspension centered around torsion bars resting at a 45 degree angle to the wheels, the pair forming an "X" at the bottom of the chassis. Don Crowley writes in: "I have some information that you may be interested in about George and Tom. I grew up in the town of Fenton Michigan where they lived . 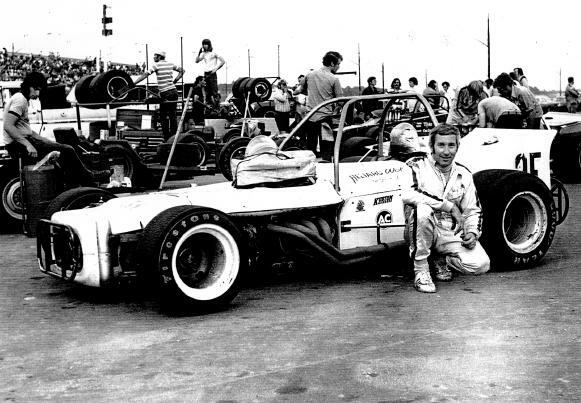 My father also raced the super modfieds and he worked with George and Tom. There is a picture of one of my fathers cars on the Retro Rockets website. His name is Bob Crowley. George was a service manager for a Buick dealership in Fenton and Tom worked there as a mechanic as did my dad. Tom was a brilliant mechanic and car builder who later worked for General Motors as an engineer. They were both on the local volunteer fire department, hunted and fished together and worked countless hours on race cars. In the early years of their racing (late 50s to 60s) they used Buick engines. This was before the big block Chevy and George always liked big cubic inch engines. I believe it was around 1968 or 69 when they got the roadster. Danny Bryant always drove for them back then and I think he might have driven the roadster a few times before Skip Manning. The picture I have of the roadster was taken at Berlin Speedway and it looks like Danny sitting in the car. This was its first time out and they didn't have the numbers on it yet but George always ran number 35 on all his cars. The car was more like the original roadster then. 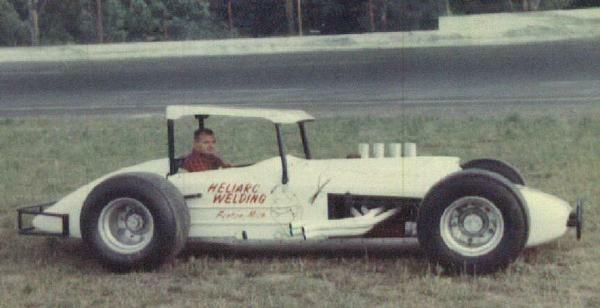 Sometime around 1969 or 70 Johnny Logan had a bad wreck at Oswego with it. He flipped it upside down and slid the length of the front stretch shearing of the roll cage injuring Johnny badly. I think it was after that when they rebuilt the car the way you describe and the way it looks now. Luckily Johnny was able to recover and continued driving for them." Skip Manning in the car. Photo is out of an old "Who's Who in Racing". The Keenan - Addy roadster.